This set of Molecular Biology Question Bank focuses on “Introns are Removed from RNA by Splicing – 2”. 1. What does the diagram denote? Explanation: The above structure denotes the mechanism of trans-splicing. In trans-splicing, the two exons are found in two separate RNA molecules that are spliced together into a single mRNA. The intron is thus spliced is a Y – shaped structure. Explanation: The transesterification reaction is mediated by a molecular complex known as the splicosome. It comprises of about 150 proteins and 5 RNAs and is similar in size to a ribosome. 3. Splicosome is a proteinaceous enzyme. Explanation: As many of the splicosome functions is mediated by its RNA components rather than proteins thus it is a ribozyme. RNAs located in the intron – exon borders participate in the splicing mechanism along with the RNAs of the splicosome to promote splicing. Explanation: The five RNAs of the splicosome are collectively known as the small nuclear RNAs. Each of these RNAs is between 100 – 300 nucleotides long and is complexed with several proteins. These RNA – protein complexes are called small nuclear ribonuclear proteins (snRNPs- pronounced as “snurps”). 5. Which of the following is not a function of snRNPs? iii) Catalysis of 5’ splice site cleavage by bringing the 5’ splice site and the branch point site close together. 6. 5’ splice site is recognized by which of the following type of RNA present in the splicosome? Explanation: 5’ splice site is primarily recognized by U1 snRNP in the pre – mRNA. Later in the reaction, this splice site is further recognized by U6 snRNP of the splicosome complex. 7. Which of the following splicosomal RNAs does not take part in the 5’ site splicing of the intron? 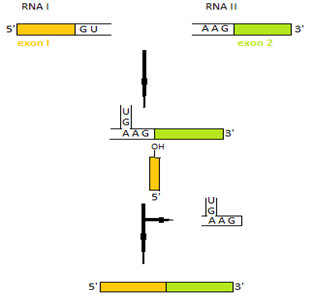 Explanation: 5’ splice site is primarily recognized by U1 snRNP in the pre – mRNA. Later in the reaction, this splice site is further recognized by U6 snRNP of the splicosome complex. The branch point site is recognized by U2 and thus these three snRNPs take part in the splicing of the 5’ splice site. 8. Which of the following component of splicosome recognizes the 3’ splice site? Explanation: The 3’ splice site is recognized by U2AF or U2 auxillary factor. This recognizes the polypyrimidine tract of the 3’ splice site. This U2AF is an RNA – free protein element of the splicosome complex. 9. Which of the following proteins is correctly paired to its function? iv) BBP – binds to branch point site. 10. Which of the following is not involved in creating the early splicosome complex? i) 5’ splice site is recognized by the U1 snRNP. ii) One subunit of U2AF binds to the 3’ subunit and the other to the pyrimidine tract. iii) The BBP then interaction with U2AF thus finally binding to the branch point site. This finally gives rise to the to the early complex of splicosome. 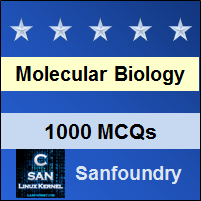 To practice Molecular Biology Question Bank, here is complete set of 1000+ Multiple Choice Questions and Answers.